Kevin Pietersen—the perennial thorn in the flesh in English cricket, the man whom everyone thought we’d moved on from, the busted flush, the bloke from a bygone era, the no-longer-under-consideration-under-any-circumstances chap—refuses, like Freddy Krueger, to go away. He’s just scored 326 not out for Surrey against Leicestershire. It may be his first championship century, and he may be playing in the cricketing equivalent to Triple-A baseball, but this is the sort of statement that no one at the English Cricket Board—even with the tinniest of ears or sternest of hearts—can ignore. 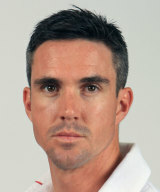 We can sort out where he’d fit in the batting order and whom to leave out, but a revived, emotionally resilient, and pugnacious Kevin Pietersen striding out to face the Australians in the Ashes this summer would be just be irresistible, and great box office as well. English cricket has been languishing in the public’s attention for too long: Pietersen’s return—a last hurrah perhaps—might just be what is needed to focus the mind again. This entry was posted in Australia, Cricket, England and tagged Kevin Pietersen, The Ashes. Bookmark the permalink. 1 Response to Heee’s Baaack!